Columbia University's EdLab produced this video on the Floating Library that truly captures the spirit of the Floating Library...Check it out! The Floating Library aboard the Lilac Museum Steamship is now closed. However, we would like to hear about your insights and what your Floating Library experience was. We are putting together a compilation of reflections as a collective pirate journal to better understand the happenings of this maritime journey. What did YOU read onboard? What future do YOU envision for the project and how can YOU make it happen? We have some ideas--including Floating Library: Salon Nights, cell phone free zones and other pop-up events--however we want to hear from YOU. 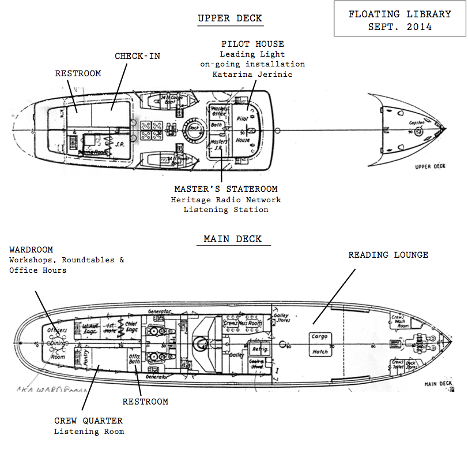 Please email your thoughts to info@floatinglibrary.org. Please also stay in touch via twitter and instagram @FloatingLibNYC and also like us on Facebook to get updates on our upcomingactivities! Please like us on facebook to get more frequent updates on the happenings! 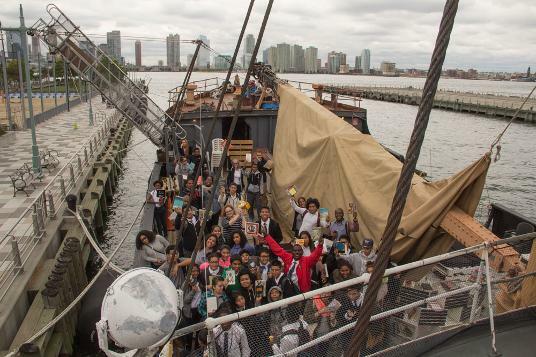 The Floating Library is a pop-up, mobile device-free public space aboard the historic Lilac Museum Steamship berthed at Pier 25 on the Hudson River in New York City for September 6- October 3, 2014. The people-powered library is initiated by artist Beatrice Glow and brings together over seventy participants to fortify a space for critical cultural production by pushing boundaries under the open skies that are conducive to fearless dreaming.The ship’s main deck will be transformed into an outdoor reading lounge to offer library visitors a range of reading materials from underrepresented authors, artist books, poetry, manifestoes, as well as book collection, that, at the end of the lifecycle of the project, will be donated to local high school students with demonstrated need. Ongoing art installations include a Listening Room that will feature new works by six sound artists in response to literature, site-specific paper rope swings, The Line, by Amanda Thackray, and Leading Lights by Katarina Jerinic in the Pilot House. During this action-packed month, there is free public programming with over twenty roundtables, performances and workshops that will shine a spotlight on maker culture, DIY politics, sustainability issues and community engagement.Some highlights include bookmaking with Center for Book Arts and Small Editions, a modular furniture building workshop with Reid Bingham, live recording session with HeritageRadioNetwork, a Sensory Walk Workshop with the Movement Party, Lighght Reading with Ugly Duckling Presse, a multimedia sound performance by Pauchi Sasaki in the Petty Officer’s Room – a space akin to being inside the belly of a whale—, and SeaChange: We All Live Downstream ( a participatory voyage initiated by Mare Liberum and 350.org) will disembark onboard for three days of office hours after traveling for three-weeks on small boats made of paper connecting climate change activists along the Hudson. Through collective placemaking, the Floating Library intends to recodify how we occupy public spaces by bringing activities that are typically confined within privileged institutional walls— such as reading, writing, researching, questioning and debating—to open space. Resituating these activities to the public sphere is a proposal to dismantle the unequal distribution of knowledge/power. Given the Lilac is America's only surviving steam-powered lighthouse tender and is undergoing restoration, orchestrating the Floating Library aboard an industrial archaeological artifact draws parallels with the balancing act we collectively perform to navigate uncertain times and shifting currents. The project intends to catalyze cultural momentum and foment future coalitions between artists, visionaries, cultural activists and scholars that will outlive the temporary library structure. While libraries are temples to worship ideas and knowledge production, they have also contributed to social stratification as print culture invented the literate class that possesses esoteric knowledge/power. The Floating Library hopes to catalyze the dismantling of this hierarchy by making education more accessible through free workshops and roundtables that encourage horizontal exchange, stretch the social imagination, and cultivate a public space dedicated to scholarship. The library will engage the public as a laboratory that brainstorms, identifies, develops and experiments with modalities to activate art and education as progressive research for socio-political transformation. Historically, coffee houses and salons have served as rehearsal spaces for intellectual and cultural movements. Yet, in New York we have lost such places where one can read or converse without loud music, a customer carrying on a phone conversation aloud, and keyboard chatter. Public green spaces are going extinct. Reading on the subway is claustrophobic. Our apartments are chicken coops. We have the Public Library, but the indoor space regulates and censors our behavior and thoughts. Given this dilemma, Floating Library intervenes as an expanded site for participatory practice and civic engagement. It is an antidote to the disappearance of mental and physical space in the increasingly urbanized and cyberized world. To enjoy this unplugged zone, library visitors will power-off their mobile devices and vow to respect quiet space. There will also be designated spaces for Reading, Writing & Drawing, Dialogue, Scanning, and Listening. The ship’s main deck will host a quiet reading ambience. Readers can BYOB (Bring Your Own Book) or browse the library. The library afloat on water is always on the verge to sail into the distance just as books contain the magic to transport our minds to unknown terrains. A reader is a dreamer/traveler/pirate as to open a book is to embark on an adventure into the wider world as well as dive deeper into oneself. Given this, the Floating Library celebrates boats and books to map a path towards a waking life, self-organization, citizen autonomy and fertile imagination. Click here to see full list of partnering institutions and donors. ACCESSIBILITY: The Floating Library is taking place aboard the Lilac Museum Steamship, an industrial archaeological artifact, berthed at Pier 25 on the Hudson River. Although we intend to make our public programming as accessible as possible, we are limited by the space, therefore event attendance will be admitted on a first come first serve basis. Please also remember that you will be entering a ship undergoing restoration. Wear comfortable shoes that you can climb ladders in and watch out for low overheads and for trip hazards. PHONE POLICY: The Floating Library is a mobile device-free zone to encourage visitors to be more engaged with their surroundings. Power off your phone when boarding and respect the quiet space.